Its quite a while since ive updated my blog, and indeed ive a few things i wanted to put up but have always had something more important to do, well. Today, ive finally decided to skip doing important things and put up something really unimportant. A while ago I was reading the manual of a toothbrush, an electric ehm “sonic” toothbrush. It said something like 40000 revolutions per second. Reading that and looking at the humble, el-cheapo toohbrush i didnt belive it, so i had to find out how fast the thing vibrates (it actually doesnt do full revolutions). Using my soundcard was out of question as that wouldnt work above 24khz. So i used a old analoge osciloscope that i got for 15 euro from a local flea market a while before. 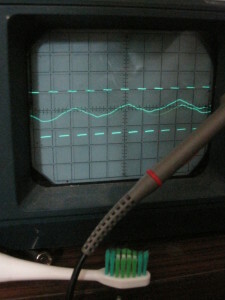 You can see on the scope, the vibration of the toothbrush head as well as a 1khz reference square wave. The trick is that the toothbrush head is made of some kind of plastic and by rubbing it against something, it becomes electrostatically charged. Just holding the scope probe near then shows the movement of the head. We can see on this that in about 6 cycles of the 1khz signal we have 2 cycles of the toothbrush, which would give ~1000/3 hz. Which proofs my way of measuring it is quite spot on, but my way of reading the manual isnt.